Rising filmmaker and actress, Lena Dunham, is making a name for herself as an unapologetic 20-something New Yorker trying to figure out life in the crazy world she lives in. 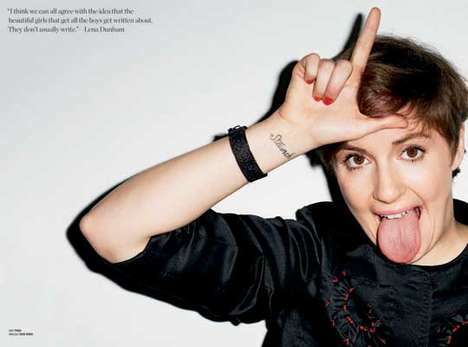 Yet the Lena Dunham people have grown to love and sympathize with on the hit HBO show 'Girls' is nowhere to be seen in the Interview Magazine February 2013 issue. Instead, it is a somber, stoic and stylish woman that poses in front of a camera. That's not a bad thing at all, just an unfamiliar one. The Interview Magazine February 2013 editorial was shot by photographer Gregory Harris. Forgoing the "self-empowerment through self-degradation" route that she usually takes, as aptly noted by Miranda July, stylist Elin Svahn outfits her in a sophisticated black wardrobe.